"Ahasverus" redirects here. For the beetle, see Ahasverus (genus). Ahasuerus (Ancient Greek: Ξέρξης Xerxes; Persian: اخشورش‎‎ Aَxšoreš; Old Persian: Xšayārša; Hebrew: אֲחַשְׁוֵרוֹשׁ, Aẖashverosh; ʼĂḥašwērôš; Greek: Ασουηρος, translit. Asouēros in the Septuagint; or Latin: Assuerus in the Vulgate; commonly transliterated Achashverosh) is a name used several times in the Hebrew Bible, as well as related legends and Apocrypha. This name (or title) is applied in the Hebrew Scriptures to three rulers. The same name is also applied uncertainly to a Babylonian official (or Median king) noted in the Book of Tobit. The name Ahasuerus is equivalent to the Greek name Xerxes, both deriving from the Old Persian language Xšayārša. The form Xerxes has not traditionally appeared in English Bibles, but has rather appeared as Ahasuerus. Many newer translations and paraphrases, however, have used the name Xerxes. The name Xerxes comes from the Greek Ancient Greek: Ξέρξης. The English name Ahasuerus is derived from a Latinized form of the Hebrew Akhashverosh (Hebrew: אחשורוש), which is a Hebrew rendering of the Babylonian Achshiyarshu: both this and the Greek Ancient Greek: Ξέρξης are renderings of the Old Persian Xšayāršā. Thus this literary change was created as the name moved across each of the language groups in a westerly direction from Persia until it entered English translations of the Bible. 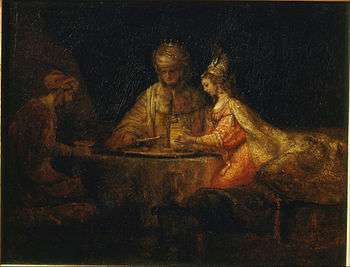 Ahasuerus is given as the name of the King of Persia in the Book of Esther. 19th century Bible commentaries generally identified him with Xerxes I of Persia. 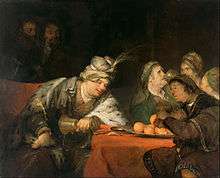 The Greek version (Septuagint) of the Book of Esther refers to him as Artaxerxes, and the historian Josephus relates that this was the name by which he was known to the Greeks. Similarly, the Vulgate, the Midrash of Esther Rabba, I, 3 and the Josippon identify the King as Artaxerxes. The Ethiopic text calls him Arťeksis, usually the Ethiopic equivalent of Artaxerxes. John of Ephesus and Bar-Hebraeus identified him as Artaxerxes II, a view strongly supported by the 20th century scholar Jacob Hoschander. Masudi recorded the Persian view of events which affirms the identification and al-Tabari similarly placed the events during the time of Artaxerxes II despite being confused by the Hebrew name for the king. 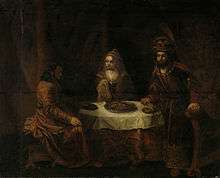 Esther Rabba and the Vulgate present "Ahasuerus" as a different name for the king to "Artaxerxes" rather than an equivalent in different languages, and the Septuagint distinguished between the two names using a Greek transliteration of Ahasuerus for occurrences outside the Book of Esther. Indeed an inscription from the time of Artaxerxes II records that he was also known as Arshu understood to be a shortening of the Babylonian form Achshiyarshu derived from the Persian Khshayarsha (Xerxes). The Greek historians Ctesias and Deinon noted that Artaxerxes II was also called Arsicas or Oarses respectively similarly understood to be derived from Khshayarsha, the former as the shortened form together with the Persian suffix -ke applied to such shortened names. Ahasuerus is also given as the name of a King of Persia in the Book of Ezra. Modern commentators associate him with Xerxes I who reigned from 486 BC until 465 BC. Other identifications have been made for Cambyses II or with Bardiya (Greek Smerdis) who reigned (perhaps as an imposter) for seven months between Cambyses II and Darius I.
Ahasuerus is given as the name of the father of Darius the Mede in the Book of Daniel. Josephus names Astyages as the father of Darius the Mede, and the description of the latter as uncle and father-in-law of Cyrus by mediaeval Jewish commentators matches that of Cyaxares II, who is said to be the son of Astyages by Xenophon. Thus this Ahasuerus is commonly identified with Astyages. He is alternatively identified, together with the Ahasuerus of the Book of Tobit, as Cyaxares I, said to be the father of Astyages. Views differ on how to reconcile the sources in this case. One view is that the description of Ahasuerus as the "father" of Darius the Mede should be understood in the broader sense of "forebear" or "ancestor." Another view notes that on the Behistun Inscription, "Cyaxares" is a family name, and thus considers the description as literal, viewing Astyages as an intermediate ruler wrongly placed in the family line in the Greek sources. In some versions of the apocryphal or deuterocanonical Book of Tobit, Ahasuerus is given as the name of an associate of Nebuchadnezzar, who together with him, destroyed Nineveh just before Tobit's death. A traditional Catholic view is that he is identical to the Ahasuerus of Daniel 9:1 In the Codex Sinaiticus Greek (LXX) edition, the two names in this verse appear instead as one name, Ahikar (also the name of another character in the story of Tobit). Other Septuagint texts have the name Achiachar. Western scholars have proposed that Achiachar is a variant form of the name "Cyaxares I of Media", who historically did destroy Nineveh, in 612 BC. In some versions of the legend of the Wandering Jew, his true name is held to be Ahasuerus. This is the name by which Immanuel Kant refers to the Wandering Jew in The Only Possible Argument in Support of a Demonstration of the Existence of God. ↑ KJV, NASB, Amplified Bible, ESV, 21st Century King James Version, ASV, Young's Literal Translation, Darby Translation, Holman Christian Standard Bible, etc. ↑ NIV, The Message, NLT, CEV, NCV, NIRV, TNIV, etc. ↑ Nichol, F.D., Seventh-day Adventist Bible Commentary, Volume 3, Review and Herald Publishing Association, (Washington, D.C., 1954 edition), p.459, "Historical Setting"
↑ The Religious Policy of Xerxes and the "Book of Esther", Littman, Robert J., The Jewish Quarterly Review, 65.3, January 1975, p.145-148. ↑ Book of Tobit, 14:15. ↑ Andrei Oişteanu, "The legend of the wandering Jew in Europe and Romania.". Archived from the original on 2008-02-03. Retrieved 2008-03-12. Studia Hebraica. This article incorporates text from a publication now in the public domain: Herbermann, Charles, ed. (1913). "Assuerus". Catholic Encyclopedia. New York: Robert Appleton. Wikimedia Commons has media related to Ahasuerus. Wikisource has the text of the 1911 Encyclopædia Britannica article Ahasuerus.